When you begin your campaign on Shogun 2 pretty much every Clan follows the Shinto Buddhism religion, with the notable exception of the Ikko-Ikki warrior Monks who practice Ikko. Religious unrest is nothing to sniff at either – it factors not only into the happiness in your provinces but also the way the other Clans perceive you. Religion can be used in various ways to get bonuses to certain troops or access to others earlier than you would normally be able to. It is also possible to use Religion as a weapon, stirring up unrest and revolt in the territory of your enemies. A powerful tool if used properly. As you play your campaign, after a few turns you might encounter a Christian Clan and wonder how this has happened, well – read on! The Nanban (Japanese term for barbarians, as they were called – basically European traders) will approach you directly after some time, offering trade in exchange for a port for them to use in your territory. The consequences of this are both immediate and time-spanning, and the whole affair can take some extensive micro managing to get through. +2 possible sea trade routes, increasing the number of other clans you can get trade agreements with. Improves the export capacity, therefore increasing trade value of the goods you are trading to others by +120 Koku. Allows for the recruitment of Imported Matchlock Ashigaru. It will convert that region's populace to Christianity. This will of course cause religious unrest and can, if left unchecked result in full scale rebellion against your rule. In comparison to your other construction option after Trading Port, the Military Port allows the construction of more advanced Japanese Naval Vessels, but is less profitable in terms of trade. However, the Military Port does not convert your population to Christianity. Once you have built a Nanban port, you will shortly afterwards get a notification advising you that the 'Nanban' have not only brought with them their gold and trade goods, but also their religion. It is suggested that the spread of this new religion should either be embraced or repressed as much as possible. Following the warning message mentioned in the paragraph above, you are now able to embrace Christianity as your clan's official religion. To do this you need to go to your Clan Management screen. 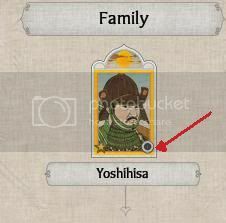 From there, in the 'Family and Council' tab, you will notice a button in the left hand corner. By clicking this your Daimyo renounces traditional Shinto-Buddhism and embraces this new religion as his own, making it the official religion of your clan. Once this has done, you will notice that a lot of the Clans you've encountered will now be notably less friendly towards you. This has happened because both your Daimyo's honour has taken a decrease, and you will suffer from the negative religious difference effect with other Clans. On the other hand, if there are any existing Christian Clans they will be much more friendly with you. From left to right you can see the change in Diplomatic relations from switching to Christianity. Remeber; if Clans dislike you they are more likely to go to war. It is not only in inter-clan diplomacy that you might suffer slightly. Thanks to the lowered Honour of your Daimyo, some of your Generals may be on the brink of treason, forcing you to ask them to commit Seppuku - and if that doesn't work they will outright rebel against you, taking some of their men with them. Adopting Christianity as your Clan's official religion also causes your population happiness untold turmoil. Not only do you need to offset the religious unrest as your Buddhist population is slowly converted, but also the lowered public order thanks to your Daimyo's reduced Honour. If unmanaged you will suffer Buddhist revolts. Sometimes you will be doing everything you can to increase Public Order; Garrisoned forces, Missionary, Exempted from tax but still the huge penalty 'Non-Clan religion' is strong enough to cause revolt. In some cases it can take many, many turns to get your population back under control. A Christian Clan must beware however, from here on out the provinces you conquer (which are likely still majority Buddhist) will also have these lowered public order levels to contend with. Unless you take steps to increase your Daimyo's honour, or convert the population before you conquer. By adopting Christianity, you will now also have the option to upgrade your Nanban Port to a Nanban Quarter and will likely receive a notification to advise you of this. 3 possible sea trade routes, increasing the number of other clans you can get trade agreements with. Improves the export capacity, therefore increasing trade value of the goods you are trading to others by +200 Koku. At this point, being that you've now adopted Christianity it shouldn't be considered a disadvantage that the Nanban Quarter also converts the population to Christianity quicker, but also spreads the religion to neighbouring provinces. Each increases the conversion rate to Christianity, and also spreads the religion to neighbouring territory. The Missionary's skill tree is much the same as the Buddhist Monk's. A player who adopts Christianity will have access to these awesome new units which can devastate an army without an equivalent. The Matchlock Ashigaru give you a large advantage when it comes to damaging morale in the early game and gives you them a long time before other clans can build them through research. The Nanban trade ship is more of a combat vessel, it's upkeep is four times greater than the standard trade ship and you do not get any income benefits. However it is far more formidable than even most of the traditional Japanese naval vessels, complete with a large crew, devastating cannons and matchlock armed guards it is a terror to face in battle. The European cannons do untold damage to castle walls and tightly packed enemy formations, able to be built straight from the Nanban quarter without the need for further gunpowder research or a siege works. On the other hand a Christian Daimyo loses out on the ability to train the formidable monk units. The campaign is likely to play out a little slower than a traditional Shinto Clan's, for the simple reason that you will need to be converting population and constructing Chapels to maintain a reasonable level of happiness before moving your army onwards. A Clan cannot change back to Buddhism once their Daimyo has chosen Christianity until that Daimyo is dead and his heir assumes the ruling responsibility. Much like the religious unrest can be a major thorn in your side as you spread Christianity throughout Japan, you can also use your religion as a weapon against an enemy clan. Use monks and churches to spread the religion to neighbouring provinces and swoop in once a Christian rebellion takes place. This will of course only work on Buddhist clans. If you do not want to convert your Daimyo and face the perils of Christianity, drawing the ire of the other Clans, you can simply deny the Nanban request to trade. Alternatively you can aim to reap the benefits of the Nanban port and do your best to manage the spread of Christianity that accompanies it. For one, you should focus on researching the 'Zen' technology so that you can build Buddhist Monasteries. These buildings convert your population to Buddhism, though it does not offset the spread of Christianity by itself. To do that you'll likely need the next building tier and also a Monk. By using this method you are getting a decent trade off. On one hand you get access to the Imported Matchlock Ashigaru, who are very valuable early game, especially when defending the walls during a siege. Although they are very expensive by early game standards and also take a long time to recruit for non-Christians; 4 Turns. However you are needing to put Koku into repressing the spread of the religion, to prevent a majority of your population converting and causing religious unrest and perhaps Christian rebellions against your rule. In summary, choose wisely. The Nanban bring the opportunity of great wealth with them, but possibly at the cost of rebellion and even additional wars if your Daimyo renounces Shinto Buddhism. Shunning the old ways is not without it's own benefits however, early access to cannons and matchlocks provides a valuable battlefield advantage for those brave enough to harness them and either tame or convert to the Christian ways. Nice article. I still haven't traded with the nanban so I don't know any of this stuff. I prefer the old ways. Great job. I like to keep my Japan isolated and all shinto though. It's also worth noting that Matchlock Ashigaru manning the walls during a siege > Bow Ashigaru. ...by a longshot. They do however seem to take more casualties if engaged in melee, so just pull them off the fortifications before the enemy breach. ....was he crafting of Japanese blades superior in durability/strength than the crafting of Eastern Blades then later Western Europe blades in the middle ages? Plunging the hot blade into water made the blades weaker whereas in the middle east they didn't really use water, they used dead animal/human carcasses. it caused some chemical reaction that really hardened steel. later the Europeans learnt it from the arabs. Excellent write-up. I've been considering trying this to get the Christian victory Ach but I'm reticent to deal with massive unrest. I think I may just convert the turn before I become shogun. Lenardius, this won't exactly provide an answer to your question; but I wrote this article awhile back about Japanese forging methods.